Brand new on the market! See it today! Move-in Ready, Stunning Country Farmhouse style Cottage in the Heart of the Hudson Valley, done to the 9's by an au currant Brooklyn designer. 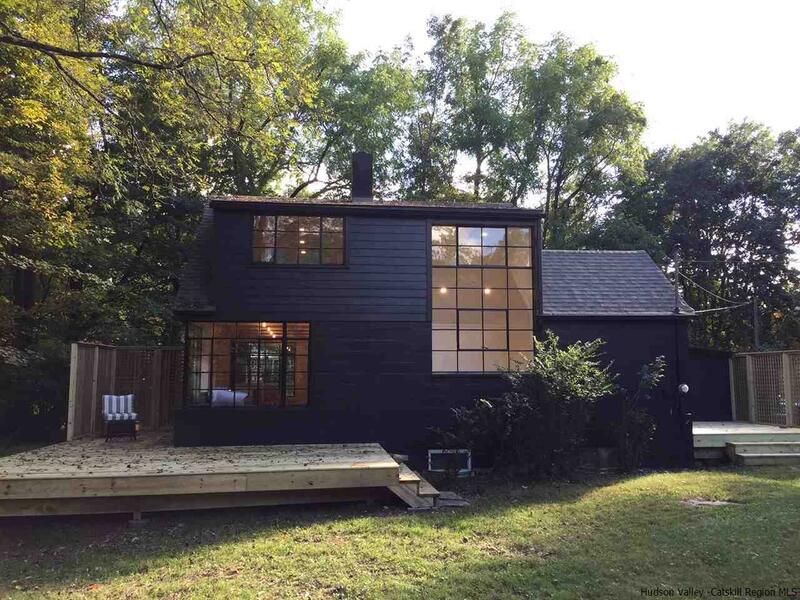 Newly reimagined early 20th-century cottage at 102 Orchard Lane, just one block to the village of Woodstock, NY. Vintage/new renovation transports you into a cool, clean, modern and luxurious space. It's the perfect Upstate escape for those seeking quiet country living in a friendly village, yet steps to world-famous arts, music, cuisine and Bus to NYC. Down a country lane, set back from the road, this 1,500-square-foot former artist studio has been masterfully restored. The dark charcoal-painted exterior, sparkling white interior and restored black metal windows are striking against the country backdrop, boldly blending past, present and future. Distinguishing elements include an open floor plan with restored original wood flooring, exposed beams, and brass detailing throughout; numerous large-scale picture windows; two exterior decks; and bright, spacious living room with original wood-burning brick fireplace. On the ground floor, the stylishly designed chef's kitchen features a 12-foot stone counter island, custom cabinetry and high-end appliances including a Bertazzoni gas range and Bosch 500 Series stainless-steel fridge. The two and a half baths are all new, with vintage subway tiles, antique brass fixtures, large-scale pedestal sink, custom built-in cabinetry, freestanding vanity, glass shower and Schoolhouse Electric vintage filament lighting. Beadboard ceilings, shiplap walls and built-in bookshelves adorn the two oversized bedrooms, one of which is laid out to enable an easy split into a third bedroom. Other noteworthy features of the restoration include new high-efficiency propane heating and central air conditioning, with all new ducts throughout; overhauled basement, with guaranteed-dry B-Dry system; new baseboards; new lighting throughout, with a mix of high-efficiency incandescent and vintage brass lights; new stone drive; restored outdoor garden beds; and newly built estate fencing for increased privacy. Located only 90 miles from New York City, in walking distance to the local movie theater and town center, this one-of-a-kind home offers a unique opportunity to join Woodstock's eclectic, creative and conscientious community of artists, entrepreneurs and outdoor adventurers.